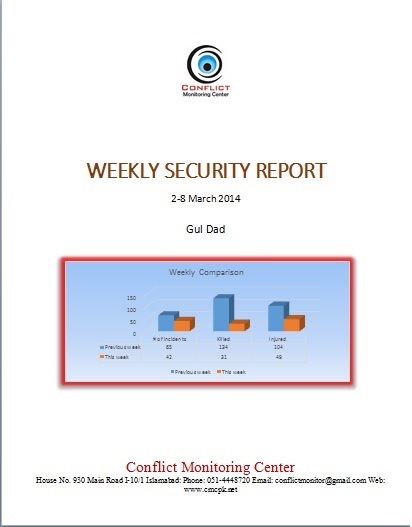 During the week (from 2 March to 8 March 2014), security situation has significantly improved as compared to previous week. Overall number of incidents related to anti-state violence dropped from 65 to 42. 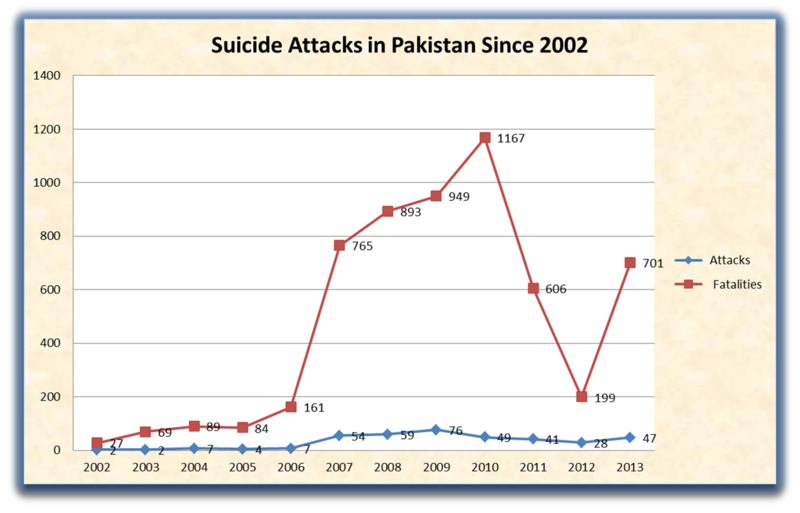 Decline in violent incidents was primarily due to a remarkable reduction in militant attacks after announcement of one-month ceasefire by the Tehreek-e-Taliban Pakistan (TTP). After ceasefire, a noteworthy 57% reduction in militant attacks is observed. During previous week (Feb 23 to Mar 01), the CMC had recorded 37 militant attacks while in last week, number of militant attacks dropped to just 16. Importantly, only two violent militant activities were reported from FATA in which four people were killed. In preceding week, ten militant attacks were recorded in FATA, in which 30 people were killed and 27 others injured. 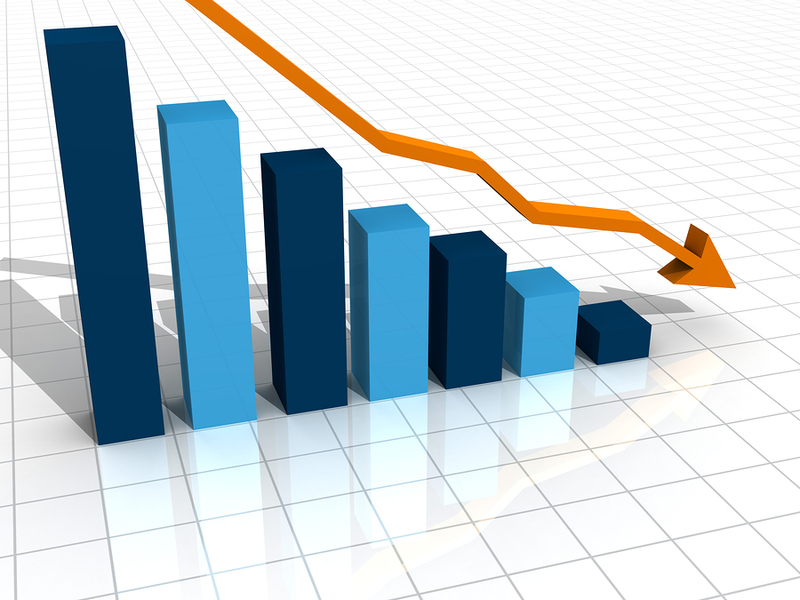 The CMC has recorded 67% decline in number of deaths in militant attacks during last week. Among the two reported militant attacks in FATA during previous week, one was carried out against a convoy of Frontier Constabulary (main paramilitary force fighting against militants in FATA) which was claimed by a TTP’s affiliate Ansarul Mujahideen. The other attack was against a NATO supply container. It is also notable that half of the fatalities in militant attacks during last week occurred just in one attack. However, the attack was most one of the most significant attacks of the current year. The militants targeted district courts and lawyers chambers in the heart of Islamabad and adjacent to a police station. The attack continued for almost 45 minutes but no response from security forces was seen at all which underlines unpreparedness of the federal security forces in the wake of any major militant attack. Twelve people had died and dozens were injured in the onslaught. Two of the attackers reportedly blown themselves up while rest of them escaped without facing any kind of resistance. A controversy is still prevalent that what was the actual number of the attackers. Law enforcement agencies are still struggling to ascertain that whether actual number of attackers was two or twelve. The attack jolted the whole nation and courts remained shut for seven days in Islamabad and a three days mourning was observed throughout the country. The attack also underscored weaker control of TTP’s new head Molvi Fazlullah over its major commanders. According to CMC sources, a major commander of TTP is supporting activities of splinter group Ahrarul Hind. The said commander was also responsible for creating deadlock in peace talks by carrying out attack on Police Bus in Karachi and beheading captured FC personnel in Kuner province of Afghanistan. Although TTP has denied its role in Islamabad attack but avoided condemnation of the attackers, which created doubts about intentions and sincerity of the group for positive peace talks. 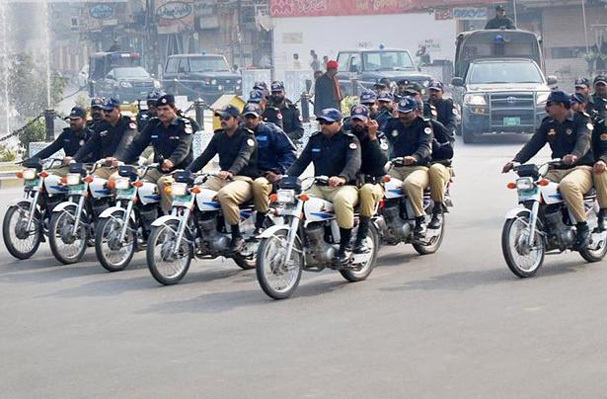 During last week, generally no letup in security forces actions was observed. However, it seems Pakistani security forces have also ceased their actions against TTP in FATA. During the week before last week (Feb 23 to Mar 01), security forced had conducted 10 actions against militants in FATA including surgical airstrikes which have now dropped to just three actions in last week. During preceding week, 69 militants were killed in security forces actions while in last week, the number has dropped to just 5. After ceasefire, security forces have focused on preventive measures and intelligence based operations in mainland Pakistan. 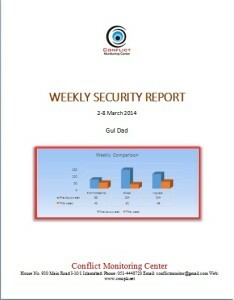 The CMC has recorded 26 security forces actions during the week. 77% (20) of these actions were aimed at busting sleeper cells of militants and arresting suspected militants and their supporters. 395 suspects were arrested during last week while in preceding week the number of arrest was 58. Last week security forces defused four IEDs averting possible human and property losses. Three IEDs were defused in Karachi, which is under ever increasing militant activities while one IED was defused in Lower Dir district of Khyber Pakhtunkhwa province. Only two surgical airstrikes were carried out during last week. In one such strike, Pakistan Air Force targeted the militants who were responsible for attacking a security forces team escorting polio-vaccine workers in tehsil Jamrud of Khyber Agency. The other strike was also carried out in Bara tehsil of Khyber Agency. Lashkar-e-Islam militant group is active in Bara tehsil which is adjacent to Peshawar city.